Bathroom 1 bath/shower, toilet, bidet, wash basin, vanity mirror. Bathroom 2 bath/shower, toilet, washbasin, vanity mirror. Open breakfast bar separates unusual circular large lounge/dining area with satellite TV, also DVD player large ceiling fan good range of books and nicely furnished. Cooker, hob, fridge freezer, microwave, toaster, kettle, Well equipped with kitchen utensils. Brand new all green 18 hole golf course newly completed, 5 minutes drive from villa. Golf club Green fees 9 holes, 30 euros telephone 0034 630 11 45 74 valid until 30 Sept 2008. Wonderful villa it was everything I expected and more ,just enjoyed every minute. Worthy of my 5 star rating. Great place well equipped villa on a nice small residential complex. Have stayed in many apartments/villas over the years this is one of the best. Quiet, Peaceful yet only five minute walk to beach and restaurants. Everything you need for a quiet holiday on a small complex. 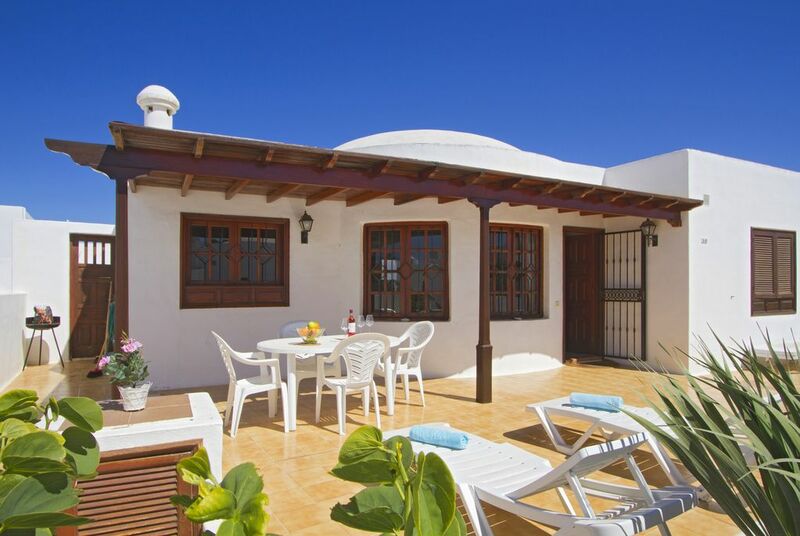 Clean and tidy villa and Owner very approachable and easy to book with. BEST VILLA I HAVE EVER STAYED IN !!! IS SO GOOD I COULD LIVE THERE.YOU MUST BOOK THIS VILLA,YOU WILL BE SO GLAD YOU DID!! The villa is fab, would certainly recommend. The welcome pack, which we didn't expect was super. The patio area was lovely and private, gets the sun all day, even added visits from a local cat. Tried to booked for next year but just missed out. But have been offered another villa in the same complex. One of Lanzarote's beautiful golden sandy beaches is only 10 minutes walk away. Once on the beach, apart from sun bathing there is paragliding, boating and swimming. Arrecife airport 10 mins drive to villa, car hire not essential. We would recommend car hire for exploring this beautiful island. We can arrange car hire from the airport or delivered to villa. Prices start at 20 euros a day. The villa is situated in Puerto Del Carmen 10 mins drive to old town with many fish restaurants and a harbour, where there is a superb new shopping centre with well known high street names. The villa is located very close to the local supermarket, shops and restaurants which is 5 mins walk away. Many activities, scuba diving (diving school), old town, sailing, water skiing, horse riding 10 mins drive. The aqua park in Costa Teguise is 30 mins drive. Deep sea fishing from local port 10 mins drive and golden sand beaches for swimming. Booking Notes: On confirmation of the holiday booking, a deposit of £150 per week is required (non refundable). The remaining balance to be paid in full 8 weeks before the date of holiday commencement. Changeover Day: Mainly Thursday but can be flexible. The cost for an additional fifth guest would be £65 per week.